06/07/2017 - We Went Wild!! LWP is not government funded and rely solely on our personal savings and public donations. The average cost for the care of a sick, injured or orphaned animal/bird is £30 (exc. any surgery or long term costs). Please consider giving a donation if you can. Our friends and colleagues at the Pigeon Recovery are introducing a fundraising project, "Pawtraits of pets". 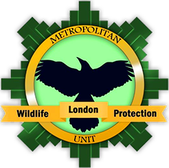 London Wildlife Protection would like to share this and spread the word. They put over forty years of artistic experience and their love for all animals into every oil painting they do. A website showing photos of animals, focusing on wildlife. Started as a site for British wildlife photos (many for the London Wildlife Trust), as more visitors, including schools, have used the photos to identify animals, it has developed to include non-British and domestic animals. Dedicated to all Pigeons. The Pigeons of London UK and beyond. Such Beautiful and Amazing birds that deserve our respect and help. Without Pigeons There is Nothing! Writer, poet, storyteller and independent environmentalist. Follow his blog, Observations from a life in progress.